The outline view gives a quick outline of the complete source file. What source files is it including? What are the variables in this file? This view can be configured. The view has following buttons. This is the explanation of each of them (from left to right). Similar to the Project Explorer, this view also has advanced preferences. If the outline view is linked to Eclipse Editor view, we can see the mapping between the two views. 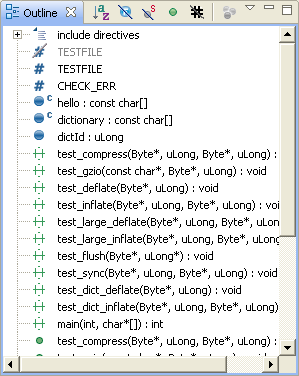 In the image below, selection of CHECK_ERR is synchronized between editor and outline. The left pane of the editor also gives a hint about the lines covered by CHECK_ERR.